"We're cool, we walk to school!" This was the message shared by students as part of the Stepping It Up project, led by Metrolinx, in partnership with the City of Hamilton, Region of Peel, Green Communities Canada, and University of Toronto. At a time when fewer children are walking to school than ever before, the project tackled the issue of car traffic with 30 elementary schools, to improve conditions for walking and cycling. This summer, Stepping It Up won the 2013 Technical Excellence Award for Sustainable Urban Transportation from the Transportation Association of Canada (TAC). This award recognizes contributions to the development and enhancement of sustainable urban transportation, as well as innovation in the approach used to move sustainable urban transportation forward. Maryann, a Hamilton parent, said, "This project has helped alleviate the parking problem which seems to be getting worse every year. I am now getting more exercise. I get to talk to my kids more." To reach more parents like Maryann this school year, a school travel campaign on Twitter and Facebook is starting conversations among those who wish to work with their school and community by providing infographics, tools and tips for walking and cycling to school. The school travel parent social media campaign launched in early September and runs until June. Anyone can follow, share, like or re-tweet information from @SmartCommute and SmartCommuter. More information at metrolinx.com/schooltravel. 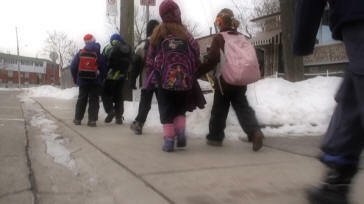 To find out more about active and safe routes to school in Hamilton, visit http://www.smartcommutehamilton.ca/en/schools/activeandsaferoutes. It would be nice if our local school boards shared the desire for walkable neighbourhood schools as opposed to larger regional schools where children have to be driven or rely on bus service to get to school.